Gibson Dunn | Budd, Thomas M.
Tom Budd is an English qualified partner in the London office of Gibson, Dunn & Crutcher, where he serves as Co-Chair of the firm’s Global Finance Group. He is a member of the firm’s Business Restructuring and Reorganisation, Financial Institutions and Private Equity Practice Groups. Mr. Budd has more than 20 years of experience in a wide range of banking, capital markets and restructuring transactions, with particular expertise in corporate lending and syndications, acquisition finance, structured finance, trade finance, real estate finance, securitisation, capital markets transactions and debt restructuring transactions. He has represented borrowers, sponsors and banks and financial institutions. Mr. Budd also has substantial experience in the establishment and financing of real estate investment funds and other co-investment vehicles (including limited partnerships, limited liability partnerships, joint venture companies, unit trusts and FCPs), representing investors, sponsors, management and debt finance providers. Mr. Budd’s practice also includes representation of companies and creditors in debt restructurings and workouts. Representative clients include Barilla, Collins Foods, Forterra plc, Intel, Kimberly-Clark and Stars Group. Mr. Budd is a regular speaker at conferences on banking and finance topics. 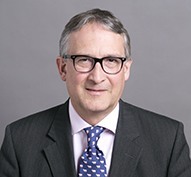 He is widely recognised by the professional press as one of the leading lawyers in his fields of practice, for example Chambers UK have ranked him as a leading lawyer for real estate finance in their 2005-2018 editions (noting that he is “a highly regarded finance lawyer”), Best Lawyers International recommend Mr. Budd in the field of real estate finance (2009-2019), and he is recognised for acquisition finance and bank lending: investment grade debt and syndicated loans in the 2019 edition of Legal 500 UK. He was also recognised in the 2017 edition for Property Finance. Mr. Budd is also ranked as highly regarded in IFLR1000 2019 for Banking and Capital Markets: Structured Finance and Securitisation. He is a member of the City of London Solicitors’ Company and the International Bar Association.